This is in Pontocho, one of Kyoto's geisha districts. The woman on the left is a geisha (called "geiko" in Kyoto), the woman in the middle is a helper, and the woman on the right is a maiko or apprentice geisha. 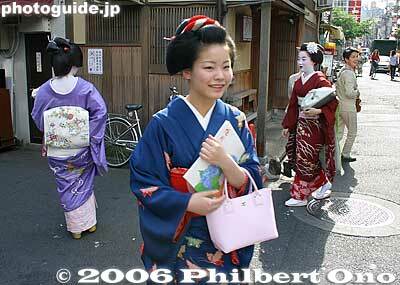 They are on their way to see the Kamogawa Odori dance performed by the Pontocho geisha in May.